Besides, most C users wouldn't use web tools to indent their code. Not me, anyway. But if you would, feel free to use this one. The worst thing that could happen is that it might at some time in the future also work with keywords and literals you do not use in your C code, where they are not supported. Any feedback on the subject very welcome indeed. I'll be sure to write some kind of article about the solution once I find out or get pointed to it. Macromedia security team got back to me reporting that they have reproduced the problem and that it fortunately only feeds mouse events to the background flash application (not including data on which window should have seen the events). I hope the Macromedia and Mozilla people get to share intelligence on the subject; I'd be delighted if the former nailed their bug and the latter found a way of fixing the entire problem class from their side. Since IE for once seems unaffected, I have hope it's possible to somehow alter the plugin interface sandbox to catch this. Oops, I just encountered a solution that Net doesn't consider valid. 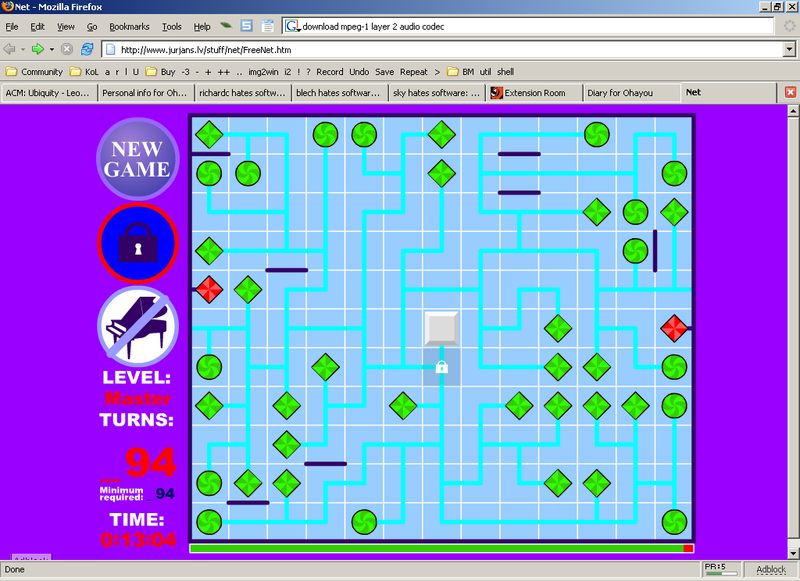 Minesweeper addicts beware: this game carries the same mind tying properties that your former brain virus did. Ooo, shiny! 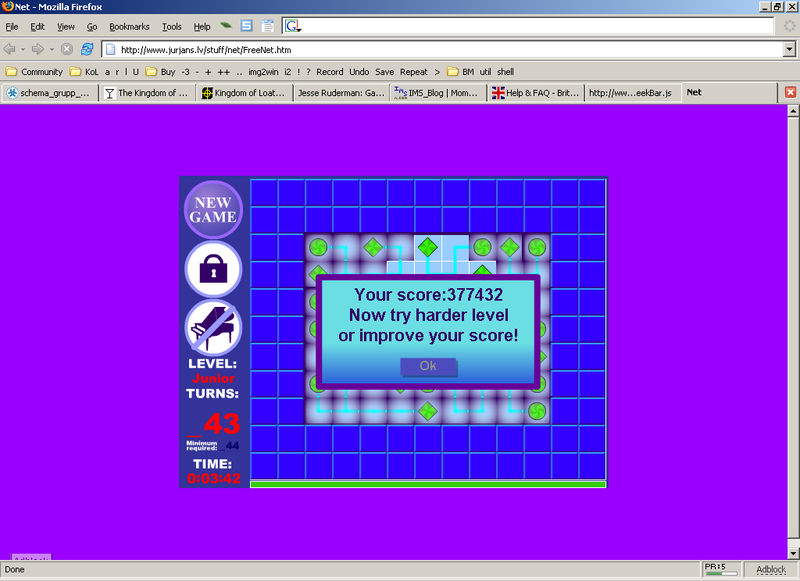 Completed the master level of Net in 13:37 (pun not intended) m:s. What an extraordinarily geeky personal record. One probably ought to quit when encountering such divine hints that there are better ways of wasting time. Firefox × Flash security hole? Hmm. 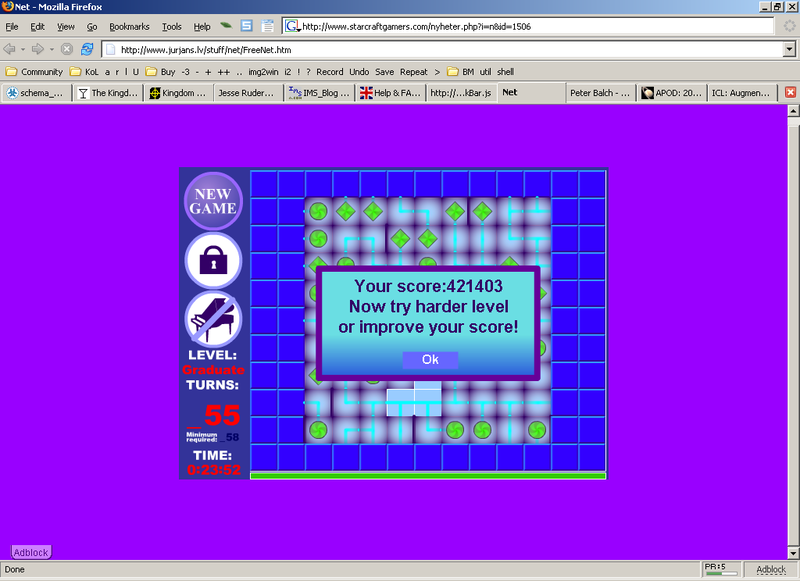 My Firefox 1.0 lets through mouse clicks in my advogato tab to the flash game running in its own tab. When clicking places in my advogato tab where the game tab had a widget, I hear the characteristic clicking noise evoked by the game. I wonder if there's a bugzilla ticket on this yet. Upon closer inspection, that's hardly a mozilla issue at all, since XEmacs and Photoshop exhibit the same behaviour. Oh, well, now it's reported to the hopefully security minded engineers at Macromedia too. And thank god for Google to totally bypass the many tightly woven webs of frustration on icky corporate websites to get to where you want to go. I tried to find that page unaidedly at first, and was very close to dying in the process. Never again. 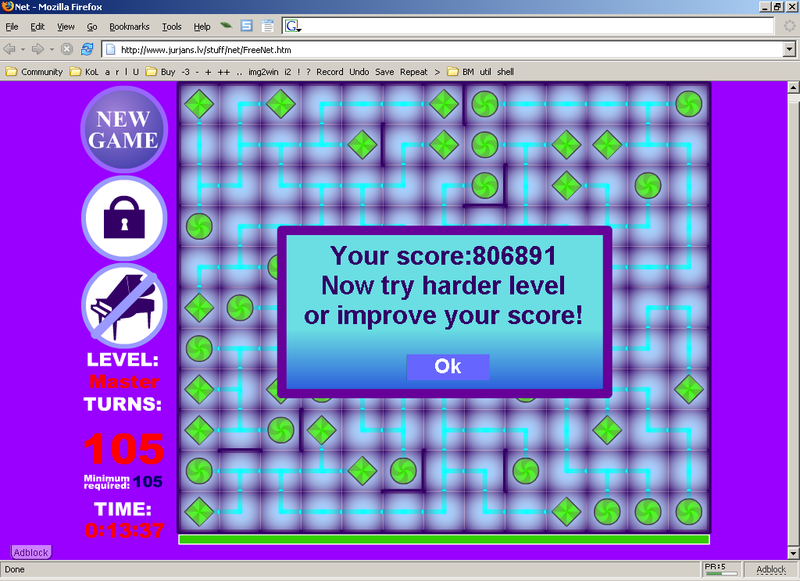 Today's addictive game encounter (pointed out by Jesse Ruderman): Net by Pāvils Jurjāns. It's one of these really good basic, well designed mind games where you have a complete overview of the board, and set it straight in as few turns (and, I presume, as little time) as possible, to the set of logic rules dictated by the game. 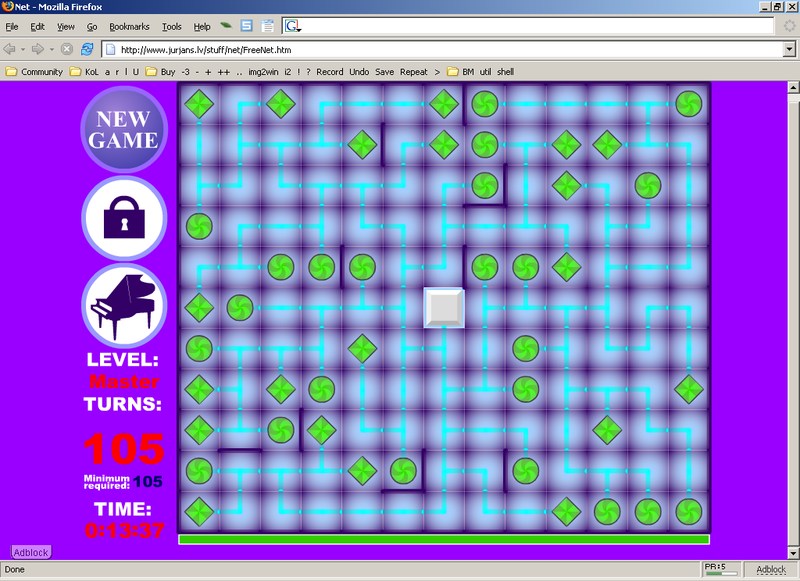 I'm not yet sure if it's as addictive as Minesweeper which, despite suffering from the misfeature of occasionally forcing the element of chance on your completion of a stage, through similarly basic rules, comes out a great time sink. 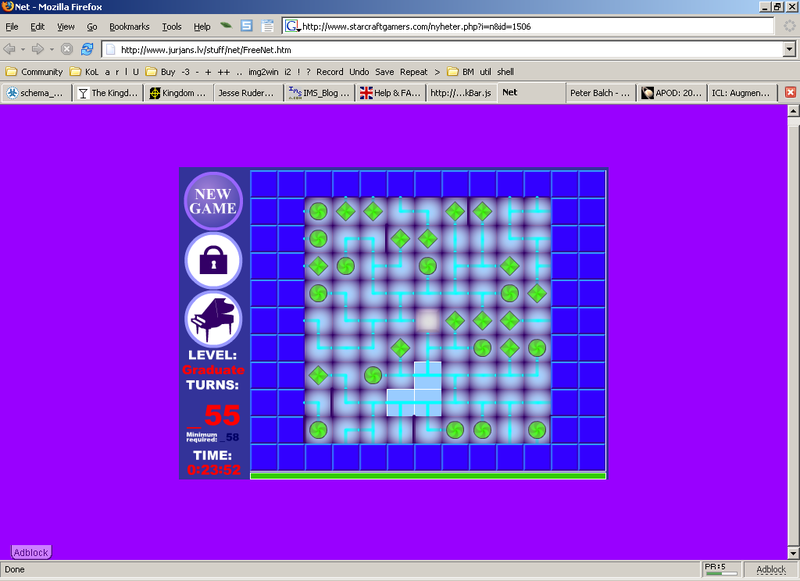 Or, as might be argued, that may well be what makes Minesweeper so compelling to some. Either way, I started out trying to find the rules, to soon be puzzled finding my optimal solutions were a few turns more than the reported minimum required amount of turns. As it turns out, the turn count was not how many times a tile had been rotated 90 degrees, but how many turns a tile had been rotated any angle you well please. (Okay, so let's not make necessary partial rotations until we know for sure just which rotation is the correct configuration of every tile.) Results crept down to suggested figures. Until I suddenly found myself having completed a minimum 44 turn stage in 43 turns. (Yay! 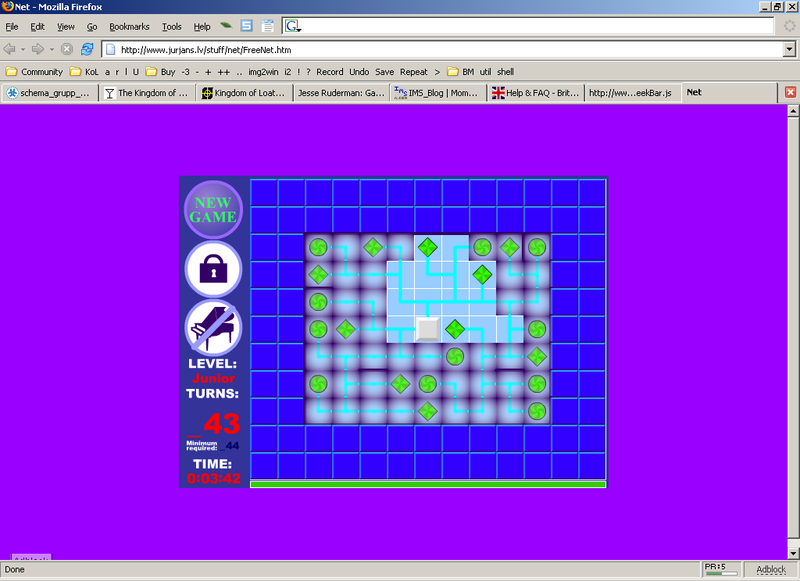 :-) Wish I'd had a screenshot of it before I started, too, but I suppose I'll bug report it, either way. Not that it matters much to game play, but the author might want to know (assuming he isn't already aware of the issue). Maybe this bug actually adds to the game more than had it not been there in the first place; it's very rewarding to not only complete a game, but to actually beat it. I'll feel much better leaving the game in a mental state of victory over leaving it after a lengthy session of having just played it successfully, beating my time scores for as many times as that remains interesting. In a free game, this might be a feature indeed, whereas it would probably be an economic set-back in a pay per play time arcade or internet game. Sometimes I miss my more active days on the web, and wish I had a blog and spent more time doing random hacks for fun, and silently publishing them where someone sooner or later might drop by, catch on, embrace and adopt them for their own joy. I suppose most of the toys I played with at the time never did catch on and spread, but my first published scriptlets gained a happy crowd at the time and a few survived, sometimes just as ideas, but to some limited extent the code did not even rot with time. At first, I got a fan mail or two about it, but since I had not left any notice about crediting my work in the source code, or visibly for that matter, or indeed any reference to myself at all except for my webmaster contact link, the replicas were untraceable back to me and started a life in the free all on their own. I think I once contacted some website admin that had credited his 404 to himself, or maybe asked for feedback on it or something to that effect, curious about whether he received any, but decided to let my baby take on whatever niches he'd find himself without my fatherly eyes on him. I just did a google search for some of the code bits, and found about a hundred pages, some from tips and tricks sites offering tutorials on how to customize and use the code on your own pages, some explaining in German how to do it, with very nicely annotated source code, one substituting the textarea for a div tag, missing some polish to get newlines to work in the switch, one rather close to the original, but also pointing out that Douglas Adams has died. I wonder if and how some note about me in the source would have changed how this play with words, code and web standards would have swept across the globe. Maybe I would have seen more mail traffic about it. Probably both in the form of the kind of joyful notes I did receive, and in the form of questions on how to adopt it and get it to run for some particular target environment. I suppose I would not have been much happier with than without that feedback, or perhaps felt bad about not responding to much of it. It is still a lot of fun to occasionally be reminded about it on random encounterns -- it's the kind of thing friends or net acquaintances occasionally tend to smile at, spread among themselves and end up broadcasting my way, too, unknowing of my relation to the code, and it is still about as fun as the first few times I saw it. It is the really simple ideas that tend to live long. The same thing applies to my scriptlets for comfy web navigation; they, too, show the same signs. In very rare cases, a complicated tool it takes hours to craft, will still be useful long afterwards, but mostly it's the small and simple ideas that live on. If (or should I perhaps more likely say "when") I ever do a fun thing like this one again, I think I will make all the paramaters broken out of the code for easy customization. In the world of the web, the precious few who know programming are most frequently also the precious few who do original work. In a way, I think that gives us the responsibility of making our work easily reusable by the masses. I'm sure that is just as appreciated as the idea itself to all the smiling visitors out there. Of course, we can rigteously selfishly also ignore this Someone Else's Problem and do just as well, ourselves. But it's not really my style. If something should be worth doing, it should be worth doing right, and while I might be able to live up to that standard with my own work, when other players get in to the picture, I can only make it so much more or less likely that they also will. I think I prefer giving them an easy climb, if it doesn't cost me too much. After reading A Conversation with Alan Kay, I got curious about the programming language Squeak, and its Smalltalk heritage. While the interview does wave past the most interesting bits, it did toss out a few interesting thoughts worth lingering at. Just like how it would have been well off to linger more at some unstated topics. For instance -- assuming neither Intel, Motorola nor "any other chip company" know the first thing about microprocessor architecture excellence (not an entirely improbable statement to hold some amount of truth) -- please back that up with some in-depth discussion about what was in fact so good about the B5000 design. So in sifting through the article, the most thought provoking statement was not much on the topic of tech stuff, but on culture, and pop culture, in particular. While I have not to date thought of a programming subculture as pop culture, it obviously has been since the home computing boom and probably will stay so, if not indefinetely, then at least for as long as the world of programming has any amount of romance and intriguing possibilities about it to offer the youth. Kay's observation "Once you have something that grows faster than education grows, you're always going to get a pop culture" struck a chord in me, in formulating why Perl, PHP, Java and mostly any other lesser weasel so easily and seemingly randomly get wide spread and recognized at the expense of better options, that are almost always on offer. The little perfectionist in me has festered on the subject for a fair amount of time, failing to make the connection to schools and learning institutes, despite actually aiming for the teaching profession myself. Pop culture isn't about quality, but of perceived quality. It takes a working knowledge of a field to find and judge quality, filtering away lack of quality at a glance. Or, as Harry Järv (wise keeper of many books) stated it: "to learn to appreciate quality [in books], the only way is to read a lot". Quality or junk; without taking it all in, you won't get any frames of reference to relate to, and you will end up embracing something on random merits when browsing through your options. It applies just as well to music, as to books, art, or indeed the art of programming. To get back to the article, though, it did rouse some curiosity about Squeak, and after a brief microfrustrating search navigating the site for a language specification, or any kind of related facts about it, I ended up with some overview outlining some history and theory of both languages. After some initial (mandatory?) waving of e-wangs and similar territorial marking rituals, the document lets the prestige levels fall to constantly berating C++ (or Java) in talking about how Smalltalk and Squawk do things instead but in a less smelly fashion. Fair enough; the document probably loses a few readers on making skirmushes of every difference between favourites and the unknown player, but in not being too attached to either target, impact was limited on my part. I suppose this attitude is one of the random factors limiting the spread of Squeak, that I think the Python guys have addressed much better. At least my gut feeling says the Python people manage to strive for excellence and adopting raisins from other camps without making enemies this way. Of course this article doesn't have to represent the language camp's disposition, but those kinds of attitudes unnervingly often spread from a source deep within the group and then stay cemented. Let's hope this isn't the case, if Squeak is indeed something worth more than a brief surveying look. I'm not convinced yet, but have only covered half the intro too.